Lithuania has entered the first stage of implementing an electronic numeration system that is called ENUM. The system will allow its users to manage contact data more effectively and at a higher level of reliability. The ENUM system allows users to share their contact data and to receive the data of other users. The system ensures retained accessibility to an individual or an organisation. Various electronic services can be used to a far better degree. WHAT IS THE ENUM SYSTEM? The growing variety of electronic communications services and technologies has had a drastic effect on the way in which we can contact each other. Many people today have two mobile phones (one for family and friends, one for the office), two fixed line phones (one at work, one at home), a fax, several E-mail addresses, a Web site, messaging systems such as ICQ, Skype, Yahoo!, Google, etc., other types of electronic contacts (SIP, H323), etc. All in all, many of us have quite a large number of contact data units. A larger amount of contact data units allows people to communicate in many different ways, and this is seen as great achievement in terms of technological progress. Management of these units, however, is no simple thing. First of all, the user must decide how many contact units should be listed on a business card. Some will clearly not be there. Second, not all units will be disclosed when meeting with others � there is usually no time for that. To be sure, the most important contact data units are provided, but providing only those which seem most important will significantly limit the ability of the new acquaintance to reach one in the most convenient, least expensive or best possible way. This diminishes the overall benefits of electronic communications. That is not the end of the story, however. When a person changes service providers and does not retain a phone number or other contact data unit, acquaintances lose contact until the change is reported to them. That is even more true if someone changes jobs. Most acquaintances lose the chance to keep in touch, particularly those who engage in few or rare contacts with the individual. Even if the change in contact information is announced in advance, many people are sloppy about updating their contact lists. This can mean losing touch with someone who might be of great importance in the future in terms of collaboration or information. The question, then, is whether it is feasible to have a single �electronic something� that could bring together all of the contact data units and be reliable and unchangeable for a longer period of time? ENUM is an abbreviation for Telephone Number Mapping. What does this mean? It means being reachable anywhere in the world through a single phone number and the best and cheapest route. DNS (Domain Name System) based architecture and protocols map a telephone number to a Uniform Resource Identifier (URI), and it can then be used to contact a resource that is associated with an ENUM number. ENUM is already operational in Ireland, Austria, Poland, Finland, Germany, the Netherlands, St Helena, the Czech Republic, and a couple of other, smaller countries. Elsewhere � in Lithuania, Slovakia, Liechtenstein, the USA, Sweden, Australia, the Philippines, Singapore, Japan, South Korea, China, etc. � the system is being tested at this time. This is how the ENUM system works. First, the registrar issues a domain name to the subscriber � the URI that will be used to access the DNS server so as to link up to the E.164 ENUM number record. The URI domain name will be associated to that number. The DNS which corresponds to the subscriber�s URI will contain his or her call forwarding and termination preferences. For instance, the telephone number +370 5 2105683 will be converted into the ENUM domain name 3.8.6.5.0.1.2.5.0.7.3.e164.arpa. A DNS query to that domain name will ultimately resolve to one or more DNS records, and that will provide an URI. This may seem to be terribly complicated, but actually it�s not. To put it simply, ENUM links a phone number to an Internet address which is published in the DNS system. Users enter their contact data units into the system, indicating which are to be made public and which ones are not. Another user searches for the contact data of the user, and once a single contact data unit is entered into the system, the whole range of the units disclosed by the original user will appear. If the first user has linked just one contact data unit in the ENUM system, then that person will always be reachable even if all other contact data units are changed. In this sense, ENUM offers the twin advantages of security and convenience. The handiest comparison to ENUM is a set of keys. We have lots of keys � home, car, garage, a couple from the office, the summer home, a postal box, a safety deposit box at the bank, etc. If the set is lost, that�s a headache at least for a week or two. If you keep the keys individually, you don�t have enough pockets. The first situation is dangerous, the second is inconvenient. How much better it would be to have a key which opens all of our locks, but which cannot be stolen and cannot be forgotten. Very much the same can be said about electronic communications applications. It is not safe to give everyone your own organiser, and it is inconvenient to use lots of different contact units, because all of them have to be stored and kept someplace. We constantly face the dilemma of having to compromise between safety and convenience. ENUM is designed to resolve this issue. You no longer have to remember lots of Web and E-mail addresses and telephone and fax numbers. You only need to know one phone number for the relevant individual or organisation, and you must have access to a telephone keypad. ENUM is a universal key which can unlock any contact notebook, and because the system operates globally, it can be said that it is a global notebook. � Carrier ENUM: Groups of carriers or communications service providers agree to share subscriber information via ENUM in private peering relationships. The carriers control subscriber information, individuals do not. Carrier ENUM is also known as Infrastructure ENUM. Lithuania is already planning to implement Public ENUM, and discussions are continuing about implementation of Private and Carrier ENUM in future. It is important to note here that the ENUM system does not replace the National Numbering Plan, and it does not change telephony numbering or administration of same in any way at all. ENUM does not use scarce numbering resources, because it only uses existing numbers. ENUM is a game for a quartet of players and a referee. The subscriber, registrar, registry and operator are the players, and the government or regulatory institution is the referee. A subscriber is a person or organisation with contact information that is included in the ENUM system. This is something different than a person or organisation using the Internet to find an address via ENUM. The registrar is the entity which manages the registrant�s access to information and ensures the public availability of information on the Internet. There can be numerous registrars, depending on the size of the market and the level of demand for ENUM services. 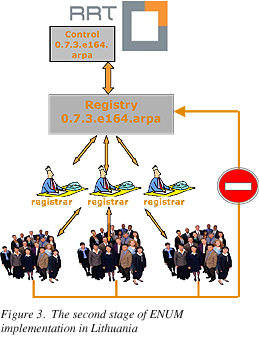 The registry is the manager of the national ENUM zone or e164.arpa. Due to the hierarchical structure of the DNS, there can only be one registry for every national ENUM zone. In practice, the registry is at the top of the national ENUM pyramid and ensures that reference is made to the registrars� servers � those where the information is located. The operators are the companies which allow their clients to use fixed and mobile telephone numbers. The government or public regulatory institution controls the national ENUM zone and performs a significant role in appointing the registry. What are the interests of all of the participants in the ENUM system? The primary benefit of the system for subscribers is the ability to communicate with others via an inexpensive and convenient range of services. The client only needs to know the telephone number of the relevant individual and have access to a telephone keypad. ENUM allows end users to choose how they wish to be contacted, offering them considerable control. ENUM subscribers can be corporations, individuals, government agencies, military organisations, and many other types of non-individual users. As far as the public regulator is concerned, the interest in ENUM lies in the attempt to open up a new market segment and create new possibilities for market participants to offer innovative services to end users and to stimulate the use of traditional and newly created electronic communications services. The interests of the other participants � the registrars and the registry � are very tangible. ENUM allows them to commercialise the new services, to fill new market niches, and to maximise profits by providing services to users. The Lithuanian Communications Regulatory Authority (RRT) seeks to ensure access to technologically modern services and to create new opportunities for business incentive and investment. The ENUM system can be seen as a new market niche for private initiative, and so the RRT applied to the relevant international institution � RIPE NCC (french. 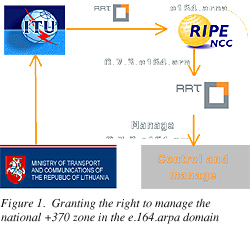 Reseau IP Europeens Network Coordination Centre) for the right to manage the national ENUM zone in the +370 country code of the e.164.arpa domain, i.e., in Lithuania. The International Telecommunications Union granted that right to the RRT in the autumn of 2007. The ENUM system is to be created in Lithuania in two stages, the first of which is being implemented now. The RRT is providing technical management of a test of the service on a non-commercial basis. This is meant to determine how much demand there will be for it. During the first three months, nearly 600 users registered their contact information in the global contact book (http://enum.rrt.lt). The service was not widely marketed, and information about it passed from mouth to mouth. It is evident, however, that there is a market niche for ENUM services. Another aspect of the first stage of ENUM implementation is creating the legal framework for private sector participation in the process. The RRT is working closely with the Ministry of Transport and Communications to develop the legal structure. A public bid for tenders is being considered as a way of choosing the ENUM registry. Final decisions are expected to be taken on these matters by the autumn of 2008. The second stage of ENUM implementation will begin on January 1, 2009, when the right to technical administration of the system will be granted to a private entity. This will create proper conditions to the new market niches for services and service packages, as well as for new types of business. It is foreseen that in future, ENUM users will be able to group their contact information in accordance to time of day (e.g., business contacts during working hours, specific contacts during holidays or at night, etc.). It might also be possible to ensure that specific contacts are made available only to specific individuals or groups of individuals. The list of potential ENUM services should create many opportunities for business innovations and creativity. All of this is still in the future, however. 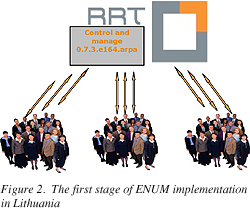 Right now ENUM is used only by one Web site in Lithuania � www.enum.rrt.lt. The service will expand once it is made available to businesses, however. Another important thing is that ENUM is developing as an independent service, which can also be contacted by foreigners. It can be assumed that this is an opportunity which the private sector, and small and medium businesses in particular, will not let slip by. It�s hard to know right now what the price of the ENUM service will eventually be for end users. The costs will probably be charged directly to the subscriber or implemented as an indirect aspect of bundled services. That will depend on the relevant service providers. The average price of ENUM services in Europe ranged between EUR 10 and EUR 30 annually. The price of other electronic communications services in Lithuania tends to be substantially lower than the European average, but that is an issue for the marketplace to decide. Note: The opinions expressed in this article are those of the author and do not necessarily reflect the views of the Communications Regulatory Authority or any other government institution of the Republic of Lithuania.